Jan. 10, 2019, © Leeham News: Boeing and Airbus came within six aircraft in their 2018 deliveries, 806 versus 800. For orders, Boeing was the leader, with 893 net orders versus Airbus 747. Looking at Orders and Deliveries for the different segments there are some interesting trends. Airbus new Hamburg FAL (Final Assembly Line) for the A320. Source: Airbus. Boeing beat Airbus on the order side and achieved a Book to Bill ratio of 1.11 with its 893 orders versus Airbus 0.93 with 747 orders. The order difference is less important, however, as both have such large order backlogs for the main segments (Single-aisle and medium-sized Widebody) that comparison brings little insight. Many orders will be moved around when airlines come closer to delivery and the problem for Boeing and Airbus is not lack of orders in these segments but rather how to deliver what is ordered. For the large Widebody segment (over 350 seats) the situation is different and we will discuss orders and backlog as we look at deliveries in this segment. To show the differences how Boeing and Airbus delivered in the different segments we put together the table in Figure 1. Figure 1. Deliveries for the different segments during 2018. 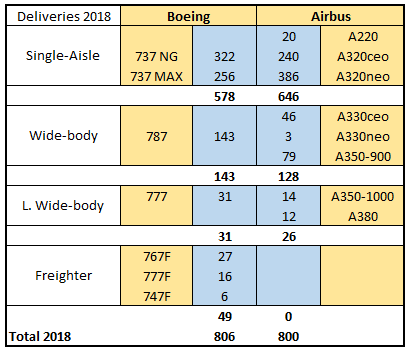 Source: Leeham Co.
Airbus has a 12% advantage in Single Aisle deliveries if we count the segment from 100 seats upwards. This is because the A220 is included since 1 July. Total CSeries/A220 deliveries were 33 for 2018, but the 13 delivered before 1st of July are counted as Bombardier deliveries. If the Boeing Joint Venture with Embraer happens during 2019 it gets more leveled again but the A220 will be further in its ramp than the Embraer E190/195-E2 during 2019, and there are not many deliveries of E190/195 classic. The A320neo dominated the 737 MAX with 51% more deliveries, whereas the 737 NG had 25% more deliveries than the A320ceo. For Wide bodies between 250 to 350 seats Boeing delivered 10% more 787-8, -9 and -10 than Airbus A330ceo/neo and A350-900. As the A350-900 ramps to around 90 units, the segment will be closer to a draw next year. But this requires the A330neo to ramp as the A330ceo is on the way down with less than 50 deliveries next year. The order backlog for the A330ceo will not allow more deliveries. Boeing still deliveries more 777-300ER than Airbus A350-1000 and A380 combined for the segment over 350 seats. But as the A350-1000 ramps, the crown in this segment will pass to Airbus this year as A380 stays around 10 and the A350-1000 ramps past 20 units. There are too few 777-300ER orders to sustain a higher delivery rate than 30 this year whereas the A350-1000 is feed with changeovers from a large A350-900 order backlog as airlines upgrade to the larger model when they come close to delivery. There is a healthier backlog for the 777X but these deliveries start in 2020. Boeing dominates the freighter market. Airbus delivered no A330-200F freighters during 2018. Noteworthy is the 27 767 freighters/tankers delivered to the market and to Boeing Defense. Interesting that if we remove freighters and focus on real passenger aircrafts, Airbus won by 43 airplanes. Remove the 20 from C-series, and still AB ‘won’. Order book is less consequential; at the end the slots are not available. BA has more immediate slots availability as it lost early on the race for single aisle to AB. So it gets more ‘late’ orders. AB (read:engine makers) can’t produce demand. Also Boeing included 5 military P-8 Poseidon to the U.S. Navy and Australia in their deliveries. Com’on, why remove freighter orders from the order book? A plane ordered is an order in the book and it does not matter if the order is for passenger, freighter or military plane. Sounds like you are an Airbus fan and trying to skew the numbers to favor Airbus. Airbus does the same with freighter and military orders, they add them to their order book like Boeing does. And if we remove passenger aircraft then Airbus has ZERO deliveries and Boeing has 100% of the market! Really nice chart by the way. I have to put that together form multiple sources each year. Make it an annual even and that would be great. Now those challenges seem better under control, the writing is on the wall on deliveries for next few years. -A330NEO: Seems not many airlines want it. Add RR issues (not solved yet really /tech+prod). AB price competes? Perhaps, if RR follows. -787 is a ‘mean’, cost efficient (now at least) machine. Going to 14+/month? this has and will continue do real damage to AB in wide-body. 145 produced in ’18. -C-series is a jewel (snatched from under the BA jaws — that one will hurt in the next years). I do not see EB able to compete outside BA massive sales price discounts against the C’s. EB’s ‘new’ airplane ‘feels’ already old. A Delta friend of mine in ATL’s (from GaTech :-)) telling me the airplane is ‘awesome’. There’s some real deep thinking at Delta about opportunities there. Going to 14 787s per month, or 168 per year (i.e. 14 x 12) means that the current backlog would be exhausted by late 2022 — barring no additional order. Even after a super-duper 2018* the 787 book-to-bill ratio for 2018 is still “only” 0.75 (i.e. 109/145). Going forward, from which airlines will Boeing amass enough orders in order to support a 787 production rate of 168 units per year? Has Emirates November 2017 commitment for 40 787-10’s been converted to a firm order? Boeing currently shows no 787 orders for Emirates, and only 8 unidentified customer orders for 787-10’s. If this order has not been firmed up, then if and when it is firmed up, it will give Boeing a 40 aircraft head start on selling 14 787’s per month in that year. I am impressed with the total Airbus numbers, even sans the A220. I would say well done Airbus. The 777 has hit over 2000 orders. That would have been a milestone close to the 727 back in the day. Of course Boeing is going to get more 787 orders. 1540 more if they can keep the lines going. DXB is a highly saturated airport. If Emirates wants to maintain and grow capacity they just might choose to defer firming up the 787-10 order indefinitely, or until phase 2 of the DWC expansion project is well underway, since Emirates will only move all operations to DWC once phase 2 has been completed. However, the $36 billion project has been put on hold. The new word on the street is that the much enlarged facilities at DWC will not be completed until 2030, at the earliest. By that time, the management at Emirates once again might have changed their minds on what type of medium sized wide-body they really need. As for assuming that everything will be hunky-dory with respect to Boeing on an annual basis would be able to secure an unprecedented amount of wide-body orders, going forward, please do not that there were 29 787 order cancellations in 2018 (i.e. gross orders of 138 units). Again, I’d be interested to know from which airlines Boeing is planning to secure the massive amount of new orders required, on an annual basis, in order to sustain a 787 production output of 168 units per year (post 2021). OV-99: My numbers were off and could not fix due to the on and off nature of the link up to Leeham. So, Boeing can ramp down if needed. Boeing will have orders coming in. So each order, book to bill or not, extends the cut off by one order. They aren’t going to just stop. They may need to ramp up more. Predicting a fall off cliff that is 500 miles ahead and assume the driver who knows its there does not adjust? Start talking in 2022 or so and then we will know that the next 5 years is looking like. In the end we could get hit by an asteroid and it all is zeroed out or it could be better or it could be the same. Like sports predictions, you still have to play the game not just talk about it. It’s amusing that my questioning on how realistic it is for Boeing to reach a book-to-bill target close to one for a prodction level output of 168 airframes per year, is labeled as “sour grapes”. For sure, Boeing would have to ramp down in due course if they’re only able to annually match this years net order intake for the 787. Believing, however, that Boeing would easily be able to even match this year’s net order intake in the years ahead, might turn out to be an overly optimistic assumption. For every ramp down, though, one should realise that any production efficiency advantage the 787 currently holds, due to higher manufacturing output over that of the competition, would be reduced. As they are undercutting the vaunted A330NEO price line, so it take them to 2000 to get the program paid for. And when they NEO it? Still uncertain whether Boeing will proceed to 14 a month on the 787 programme. The backlog is 622 as of December 2018. At 12 per month, this translates into 4 years of production. At 14 per month, it is only 3.7 years of sustained production. No, Boeing has proceeded to 14 a month. Part of my point was now with that ‘mean’ 787 machine, knowing the 787-8 saga is over, BA can discount crush the A330neo/A350 as it sees fit in strategic sales campaign. BA has absorbed the initial $25-30B 787 loss — amazing again by itself. Little to do with how good the A350 is — everyone’s saying it’s a fine aircraft. But it’s early in $$ return. BA maynot give it the $$ margin. The A330 later 4-6 years success was an aberration due to BA initial 787 many blunders. As neo, with the pricing BA can now do on the 787, it feels it has lost its raison d’etre even as neo. What they did from the get go is turning “cost” into a bookkeeping “asset” aka “deferred cost”. That bow wave still has tsunami size. Afaics it is an unrealistic assumption that Boeing has reached their initial production cost estimations ( from before 2004..5 ) and is thus able to offer low pricing. They seem to have strongly leaned on suppliers to “adjust” upstream pricing . Noteworthy is the Hawaiian displacement: An environment where “dumping laws” could be used to offer low ball pricing while Airbus was “entangled”, held off. Delta converted 35 A220-100’s to A223’s and placed an additional order for 15 A223’s bringing their total A220 order to 40 x A221’s and 50 A223’s from the 75 Cs100’s. Early days but can see that DAL could be interested in an A220-500? The “real” number isn’t the amount of airframes shipped but the revenue and profit generated by those shipments. We’ll have to wait a little while to get those numbers, but I suspect that once again Boeing will win where it counts. Go tell that to Jeff Bezos. Tell him that his whole strategy was wrong. However, I acknowledge that revenue and profit are important, but I believe Boeing is more driven by short term results than is Airbus. I am shifting to Boeing is making so much money it can now do both. Will see how I do as a seer! Keep in mind they did what they were not allowed to and sold 787s below A330NEO costs. The gall. Exactly how much profit has Amazon made? That is exactly my point. Amazon was/is prepared to forgo short term profits, built market share and now totally dominates their market. But that doesn’t mean that the shareholders of Amazon are disappointed with getting no dividend. The appreciation of their stock makes them very happy indeed, and if they need to sell some it is a much more tax efficient way to receive money. And no stock buy backs! Over last decade S&P 500 companies have had stock buybacks to the value of $4.4 trillion. Yes trillion. Biggest of those was Apple with $226 bill. It’s so funny to see these two. Next time in a knidergarden argument i will remember how these two large companies behave and try to somehow get statistics that show the other company lost the rat race. Overall a good year for the industry, both faced challanges and did perform well. Next years I see Airbus in front- A350 production ramps up so does A330neo and this should put Airbus in the lead. Also B777 will drop due to modell change to B777x. And Airbus will have it’s management change done, so there should be more focus on operations. Still fascinated Boeing produced more B787 as A330, A330neo and A359 together. 787 production is peaking. The A330neo just started flying and the A350 rank up is just starting. So that is not surprising. To me at least, the interessting thing to watch for is how the larger numbers of 777-200’s and -300’s will be replaced especially, with oil prices going up and the fast emergence of long haul low cost airlines. The A350 family will allow for an almost apples to apples replacement as far as size, payload, range is concerned but with significant reduction in fuel burn. Going the 777X/787 route may not fit as well, mostly because of the 777X family which is large and or heavy and not suited for the majority of airlines like the A380. The 787-10 is a jewel and will likely do very well as an efficient large medium haul plane and will certainly pose a treat to the A330neo. The 787-10 could become a very useful aircraft for many airlines in future, many routes don’t require ranges of more than 5000Nm. Was wondering how much AB can stretch the A359 using the current XWB84 engines, wing and landing gear to give an effective range of ~6000Nm? Will be relatively low cost and fast to do and a tick a lot of boxes for many airlines. Oil Price? Short of a Fox induced war is going nowhere. Fracking tech and yes carbon control legal/gov stuff will neuter it. Look at the 20y share price chart of Schlumberger Oil Services. An historically very well managed company still. There is an underlying trend despite the coal loving boys temprary at the helm. And my german wife wants a Tesla as our next suv. Not a BMW anymore. Wow. That stunned me. The Diesel Betrug (national cheating) is leaving marks even in DE. Boeing has traditionally dominated the wide body market. It is really interesting to see the A350 being split into 2 different categories. My impression is that the A350-900 is identical to the B777-200, but why is it categorised differently? I don’t see long haul LCC 777/A350 in the future. Norwegian is in major trouble and Air Asia has not come thorough well at all. Think a lot of AB hopes for the 330NEO’s is as replacement aircraft for 330CEO’s operated by airlines from China. The CR929 could be a bigger threat than the 787’s in that part of the world for for the 330NEO’s. Which makes me wonder if AB could become involve in one way or another with the CR929 program? LCC long haul still has to prove it’s working. Scoot is maybe but has major support at SIN from mother SIA. The -10 doesnt see to much sales (170). Also it’s too big on smaller routes. It’s a 350 pax aircraft with less thant 6000nmi range. Usefull for some routes from big hubs like SIN or DXB, maybe in Asia and cross Atlantic. Orders show SIA, BA, United, Emirates, Qantas….exactly Airlines with those routes. I see -9 getting most orders. Bjorn – does the order count for AirBus included the recently announced but apparently signed in 2018 135 firm AB220 orders from JetBlue, Moxy and Delta? Yes, they came up with like 400 in the last few weeks. As predicted, the A220 is beginning to roll big time. 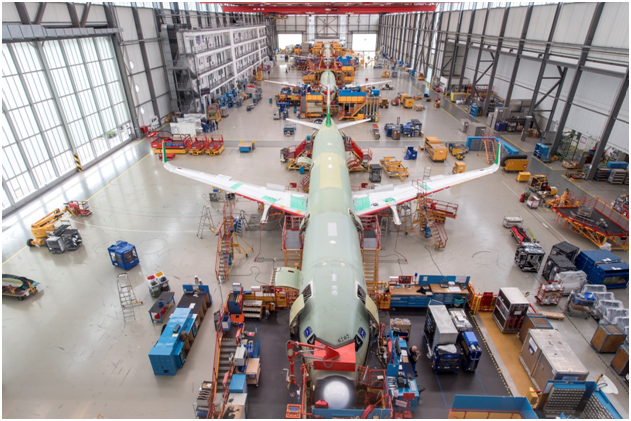 Airbus will have the Mobile A220 assembly line working in third quarter of 2019. Clearly they had the extra tooling to make that work and Mirabelle will get more efficient this years as well. 2020 will see an avalanche of A220. Boeing likely will close on Embraer for 2019. Single aisle is impressive for Airbus. Boeing gets Embraer in the 4th quarter so will be next year before the production adds to Boeing total. Any news on progress with the MAX10, think first flight was scheduled for Q4 of 2019? According to the website at the link below, 737 line numbers 7373 through 7394 are in final assembly as of 1-10-19, and the first two 737-10’s have been scheduled for final assembly with line numbers 7644 and 7705. At a production rate of 52 per month (it is supposed to go to 57 in 2019), that would mean that the first 737-10 should start final assembly in (7644-7394)/52 = 4.8 months, i.e. May or June 2019. According to the same website, the first 737 MAX 8-200, line number 7285, is out of final assembly and in pre-flight prep. Thanks AP much appreciated, know you could pull the bunny out of the hat on this one. Bottom line, MAX10 first flight most likely still Q4 of 2019. Was wondering if CFM is working on an -1B derivate that could give an additional 1-2Klb thrust? If you count up total M’TOW or total list price of deliveries, it looks like Boeing is still ahead by about 10% overall. Airbus could surpass Boeing in five or ten years. Perhaps the 797 will give Boeing a boost back ahead in that realm. On the widebody side, it looks like the A350 and 787 are about equal on orders and potential output. But, the 767 and 777 combined will continue to exceed the A330 and Boeing will stay ahead in widebodies for the foreseeable future. To be honest AB needs to have a hard honest look at their wide body strategy. The 330NEO most likely a much better aircraft that airlines perceive, but its airlines/lessor buying aircraft. Boeing has the freighter market, was often wondering about an 339/33K freighter model in the long run but bigger fish to fry. A freighter model of the the 321 based on the potential ~100T MTOW of the 321XLR could have a niche application? In the short term for 2019 a revised/updated wing for the A32X family most likely as important as for AB as the NMA/797 is for Boeing. And lastly, the A388, glad I don’t have to make that call. Do you spend money on an A380-900, A330 replacement/MoM or NSA/FSA. EK is not the only airline in the world and they haven’t been overly good with AB on the A350. A350 net orders through 12-31-18 according to Wikipedia. B787net orders through 12-31-18 according to Wikipedia. You consider orders and potential output for the 787, with 1.57 times as many total orders as the A350, and 1.41 to 2.725 times as many orders per year than the A350 over the last three years, to be about equal to orders and potential output for the A350? For those who may accuse me of cherry picking years, I would assert that I dis Airbus a favor by not including 2014, and 2015 (negative net A350 orders). Airbus last sold more A350’s than Boeing did 787’s in 2013. Here are the order figures for 2013, 2014, and 2015. Total A350 net orders 2013 to 2018 = 312 (Average 52 per year). 787 AVG 2013 to 2018 / A350 AVG 2013 to 2018 = 92.5/52 = 1.78. Hence my initial comment as per the 787 to be a ‘mean, mean’ machine by now. BA can really use to neuter the A330neo and future A350 sales. I don’t think the 787 is anywhere close to being fully amortized, but I think that Boeing and the investment community are comfortable that the deferred costs on the program will reach zero by the end of whatever accounting block Boeing is currently using. Zeroing out the deferred costs in a program accounting model means that the program profit margin assumed in the model was achieved, not as commonly misunderstood, that the program has reached break even. The more 787’s Boeing sells, and the larger the accounting block gets, the lower the deferred cost per aircraft that must be recovered to meet the profit margin goal for the program. People here tend to worry a lot about 25 billion USD of deferred costs. That would be a lot or paychecks or weekly allowance payment for most (all?) of us, but when you are a company with levered free cash flow currently running at 13.8 billion USD a year, it is not such a big deal for a program that should have at least 15 good years left. For comparison, free cash flow at Airbus is running about 4 billion USD per year, vs. 14 billion USD per year for Boeing. Yea I saw the 787 and A350 comment and it was, really? Assume a great market and a 787 rate 14, that is 1680 each 10 years. Wildly optimistic but…..
777 along swamps the A330 without the 767 thrown in. Which is back up to rate 4? 767 is back to nipping on A330 heels production wise alone. Late comment on my behalf, but your’s a much better way to express how at the end i also really feel, AP_R. God choice of words. I used the word orders when I meant backlog. So from my initial starting point, I think the ten year forecast for both aircraft would be about equal at 1,500 each. Does it now look like the 787 has some advantage in technology, production, price, and sales? Perhaps it does, and the ten year production will exceed that of the A350. What are the advantages of the 787 over the A350 which are coming into focus at this time. When is the earliest realistic re-engine for either aircraft, 2028, 2030? They serve different markets with a sort of slight overlap. Its where is the big sales, 787/A330 or the A350? And call it the A350-900, it seems the 1000 is more a 737-900/9, niche not main. 777X may well be too big. The A350 really drove the 777 out of that market. Well RR has already re-engined the 787! The next big jump is GTF and that is 2025 for RR and would Boeing trust them. P&W will now be on the same timeline though they could have moved earlier if they got the bid. GE? Hard telling where they are going right now. Current hot but way behind on GTF. It seems a collaboration with PW would be in GE interest and they have the GP alliance to work form and that has been highly successful. Can see the 35K be a late bloomer along the lines of the 77W, maybe wishful thinking but can see the 35K picking up a significant percentage of 77W replacements. A modest (~4.5m?) stretch 35K with around 400 pax and ~6500Nm range could a be sought after aircraft as it should give the 779 a serious run for its money on per seat mile cost and suitable for many routes. Don’t know what the real world prices are but the list price for the 35K is ~US$30M less than the 778 and US$55m less than the 779.